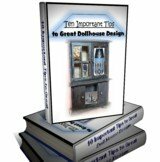 These Dollhouse Site Tips are provided for your convenience. If you need to know something about our site you can look here. If it is particularly important you will find it here. If you do not find what you desire with these dollhouse site tips you can always contact us here to voice your concern. You will not be able to search our entire site from this area. This box only searches within the Log Doll House (our example) category. For any other search put your keywords in the box at the top or left area on the page. These two places will give you site wide results. At the bottom of the search box, located with the products, you can go back to the beginning of the Log Doll House (our example) category by pressing any link labelled Log Doll House (our example) . You will return to At-the-Doll-House.com's home page by clicking on the links with that name. You can view your shopping cart for Log Doll House (our example) at any time and delete any item not wanted. Click on any item pictured for more information about that specific product. You obviously have gotten to this page by clicking on the link "Check out this information block for a word about the above Search Box..." Simply substitute that product box's category where the word Log Doll House (above) appears. It will have to pass my inspection though. Thanks in advance for your contribution.